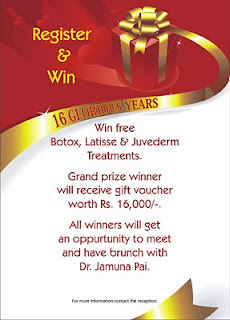 Register and you could stand a chance to Win free Botox, Juvederm and Latisse Treatments. One grand prize winner receives a gift voucher worth Rs. 16,000/- from Blush. Winners announced weekly. All winners get an oppurtunity to meet and have brunch with Dr. Jamuna Pai. hi maam, i wanted to do lip fuller up or any lip cosmectic treatment which can make my upper lips beautifull because it got damaged/ affected after i unknowgly applied of hair remover cream on my upper lips now its look ugly. i wanted to make it perfect before my wedding. will u pls help me out with this and tlme how much does the treatment will cost and how many days the treatment goes because am from colombo. i like to have treatment from u.